grandma's cookie jar: I Have a Winner in my Mothers & Babies Game Give-away! 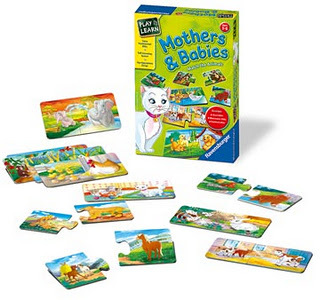 I Have a Winner in my Mothers & Babies Game Give-away! I'm delighted to say Debra Campbell Rogers is the winner in my Mothers & Babies game give-away! (You will find my review of this game at this link) Thank you Debra for reading grandma's cookie jar and thank you Ravensburger for sending me a game to review and for making another available for me to give away! Remember, I give away a lot of things . . . when I draw a name for a give-away I give the winner 30 days to get their address to me - I post the name of the winner on facebook and I message them directly on facebook. If I do not hear from them in this amount of time, I have another drawing. Please double check your facebook messages to see if you might have missed noticing when your name might have been drawn in a past give-away! And remember . . . I'm giving away an American Girl doll on December 1st!